But how great? 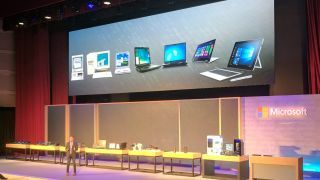 According to Pete Bernard, Principal Group Program Manager for Connectivity Partners at Microsoft, these portable PCs will be nothing short of a revelation. Hopefully we’ll see some great Black Friday deals in the UK on Windows 10. There's sure to be some great bargains during Black Friday in the US and Black Friday in Australia, too. Of course, Microsoft can be expected to talk these laptops up, and we won’t know for sure until we get some hard figures for claimed battery life – and indeed until we’ve tested these notebooks ourselves – but color us more and more excited about exactly what these portables will offer, particularly when it comes to longevity on the move. On top of that, you can add in the fact that Microsoft is working to improve Windows 10’s efficiency with power consumption, recently claiming that the Creators Update (delivered back in the spring) brought a sizeable boost to laptop battery life. The Fall Creators Update rolls out from today, and will hopefully bring further advancements on this front. All of which means we’re definitely moving in the right direction in terms of laptop longevity.